OLTRE 100 KG DI BRANZINI (NOTI ANCHE COME “SPIGOLE”) SONO STATI SEQUESTRATI NEI GIORNI SCORSI NEL CORSO DI UN BLITZ CONGIUNTO, ESEGUITO DA MILITARI DELLA GUARDIA COSTIERA, AGENTI DELLA SEZIONE COMMERCIO DELLA POLIZIA LOCALE DI GENOVA E VETERINARI DEL SERVIZIO DELL’ASL 3 GENOVESE PRESSO IL MERCATO ITTICO DI “CA’ DE PITTA”, NEL LEVANTE CITTADINO. L’AZIONE CONGIUNTA E’ SCATTATA LA NOTTE TRA MERCOLEDI E GIOVEDI SCORSI E UNA NOTA AZIENDA DEL MERCATO DEL PESCE E’ FINITA NEI GUAI. DA ALCUNE SETTIMANE, IL REPARTO COMMERCIO DELLA POLIZIA LOCALE, DISTACCATO AL MERCATO DI CA’ DE PITTA, GRAZIE ALLA COSTANTE PRESENZA PRESSO TALE STRUTTURA E ALL’ATTENTA ATTIVITA’ DI MONITORAGGIO DEI PRODOTTI IVI COMMERCIATI, RISCONTRAVA CHE ALCUNI OPERATORI, TRA LE TRE E LE QUATTRO DEL MATTINO, ALL’ARRIVO DEL CAMION DEI PROPRI FORNITORI, ERANO ADUSI STACCARE LE ETICHETTE ADESIVE APPOSTE SULLE CASSE CONTENENTI I BRANZINI ALLEVATI IN GRECIA, RENDENDOLE IN TAL MODO “ANONIME”. 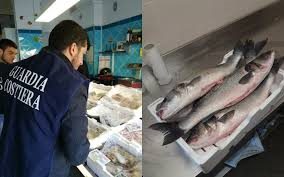 I BRANZINI VENIVANO POI RIVENDUTI POCHE ORE DOPO A IGNARI TITOLARI DI PESCHERIE E RISTORANTI, NONCHE’ A SUPERMERCATI DEL GENOVESE COME “PRODOTTI PESCATI NEL MEDITERRANEO”. CON TALE “GIOCO DI PRESTIGIO” L’AZIENDA ACCRESCEVA IL VALORE COMMERCIALE DELLA MERCE, ATTESO CHE IL BRANZINO DELLA GRECIA E’ PIU’ ECONOMICO E DI MINOR PREGIO, ANCHE RISPETTO A QUELLO PROVENIENTE DA ALLEVAMENTI NAZIONALI. LE CASSE DI BRANZINI, SUCCESSIVAMENTE, VENIVANO DICHIARATE SUI DOCUMENTI COMMERCIALI EMESSI DALLA SOCIETA’ COME PRODOTTI “DI CATTURA”, AD UN PREZZO MOLTO PIU’ ELEVATO, MA SEMPRE INFERIORI AI PREZZI CORRENTI PER I BRANZINI PESCATI IN MARE, “SBARAGLIANDO” LA CONCORRENZA IN TALE SETTORE. L’ATTIVITA’ ILLECITA E’ STATA MONITORATA PER ALCUNE SETTIMANE DA VIGILI E CAPITANERIA, FINO A QUANDO, LA SCORSA NOTTE, E’ SCATTATO IL BLITZ, CHE HA PORTATO AL SEQUESTRO DI UN’INTERA PARTITA DI BRANZINI, TUTTI DI GROSSA PEZZATURA (TRA I DUE E TRE KG AD ESEMPLARE), CHE LE ASTATRICI FATTURAVANO COME “SPIGOLE PESCATE NEL MAR MEDITERRANEO”. I TRE TITOLARI DELLA NOTA AZIENDA SONO STATI QUINDI DENUNCIATI A PIEDE LIBERO ALLA LOCALE PROCURA DELLA REPUBBLICA PER IL REATO DI FRODE IN COMMERCIO. CHE I PRODOTTI SEQUESTRATI SONO PROVENIENTI DA IMPIANTI DI ACQUACOLTURA, NON DAL MARE APERTO. I MILITARI DELLA GUARDIA COSTIERA E GLI AGENTI DELLA POLIZIA LOCALE HANNO PROCEDUTO AD ISPEZIONARE ANCHE LA SEDE LEGALE DELL’AZIENDA RISCONTRANDO, NELL’ACQUISIZIONE DI BOLLE E FATTURE, CHE TALE “ESCAMOTAGE” ANDAVA AVANTI ORMAI DA DIVERSI MESI, PERMETTENDO ALL’AZIENDA IN QUESTIONE, MOLTO NOTA NEL SETTORE, DI RAGGIRARE NUMEROSI COMMERCIANTI DI GENOVA E PROVINCIA. A CARICO DEL LEGALE RAPPRESENTANTE VERRANNO IRROGATE, INOLTRE, LE PREVISTE SANZIONI AMMINISTRATIVE PER IL MANCATO RISPETTO DELLE NORME COMUNITARIE SULLA TRACCIABILITA’ DEI PRODOTTI DELLA PESCA. L’OPERAZIONE HA PERMESSO DI RAGGIUNGERE GLI SCOPI PUBBLICI FINALIZZATI ALLA TUTELA DEI DIRITTI DEI CONSUMATORI, SIA SOTTO IL PROFILO DELLA FRODE AFFINCHE’ I CITTADINI NON SBORSINO CIFRE INADEGUATE AL VALORE DEL PRODOTTO, SIA PERCHE’ SULLA LORO TAVOLA GIUNGANO PRODOTTI ITTICI SANI, BEN CONSERVATI E LA CUI PROVENIENZA SIA CERTA E SICURA.